Blessings in Christ to you, my brethren of the Light. What we have been discussion during our Sunday sermons is placing value on the privilege and responsibility of being “in Christ”. You can read through Ephesians chapters 1-2 and see a lot of the blessings of being “in Christ” right there in that passage. I have been issuing challenges for us to grow not only in our understanding, but our expressing of “knowing Jesus”. 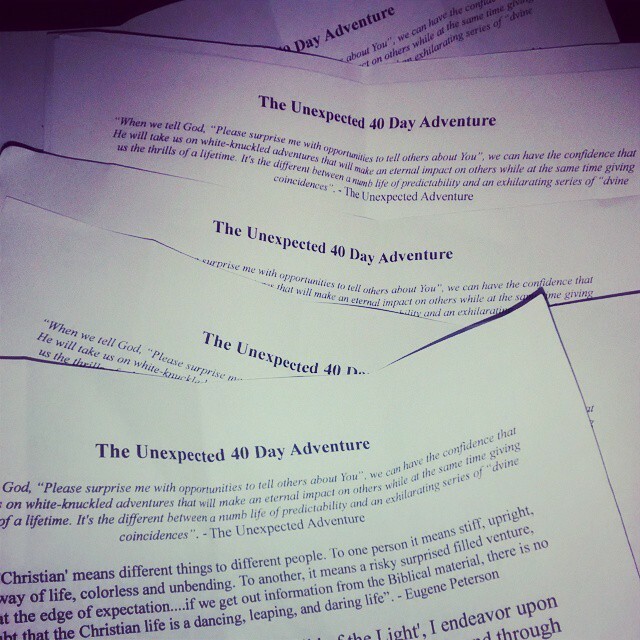 This past Sunday, I issued the Unexpected 40 Day Adventure as a challenge. We will begin on Saturday, November 22nd, 2014 and will end on Thursday, January 1st, 2015. I believe we are called to “life to the full” which I believe we live by following the “royal law” (James 2:8). In keeping with “loving others” and living that exciting adventure of helpings others gain clarity about life and the things of God. As we go through this 40 day adventure of us all being challenged to share our faith with others in natural and creative ways, I will share insights from the book The Unexpected Adventure by Mark Mittleburg & Lee Strobel. So for 40 days, as we enjoy the reality of living our lives with clarity, we will walk as we are called, to shine that clarity into the lives of others. So now just imagine….in our obedience to God we will gain amazing insights and testimonies about “living in the Light” and sharing that Light with others. Surely our Lord blesses obedience. Wheww….I must admit I am glad that the month of October is behind us. I praise God for all that I have learned through the power of His Spirit and the inspiration of His Word throughout the month. We at The Blue Point Bible Church (www.bluepointbiblechurch.org) have been “going through hell”. It was such a blessing to see how Biblically mature the congregation that I pastor truly is. We invited speakers from both persectives – Annihilationism or Eternal Conscious Torment (However, I believe I made it clear throughout the month that we in no way, shape, or form will endorse “Universalism” being preached from a ‘Christian pulpit’). This time allowed us to show how we truly are like the “noble Bereans” who listened to the Apostle Paul with eagerness and searched the Scriptures to see if what he said was true in Acts chapter 17. In this blog, I want to share some of my post-conference thoughts and give you the opportunity to listen to all that we learned during this conference, on podcast. In this blog you will find both the podcast links and some of my notes during the conference. Brother Joe Daniels and his wonderful wife, Ginny, came to visit at the beginning of the month. Brother Joe told me he enjoyed my message that morning, however in the evening he was willing to preach his position on ‘Eternal Conscious Torment. Jesus speaking, “Therefore I said to you that you will die in your sins, for unless you believe that I am He, you will die in your sins”. Simply put, you must affirm that Jesus Christ is God, or….you die in your sins. That is not an interpretation. That is the direct words of Jesus, our Lord. The punishment? Dying in your sins. Brother Joe rightly established that he does not believe in the “hell” many speak of as a final place of punishment for the wicked, instead he believes the final place is “the lake of fire” (see, Revelation 20:13-15). Joe then quoted Matthew 26:24 to establish his case for punishment beyond mere non-existance. “The Son of Man is to go, just as it is written of Him; but woe to that man by whom the Son of Man is betrayed! It would have been good for that man if he had not been born”. Clearly Jesus is speaking in reference to being betrayed by Judas. While it was prophecy being fulfilled, the will of God, that He suffer as the sacrifice, it is still damning that someone would give him over to be killed. The point Brother Joe was trying to make was that this text demands that Judas’ fate is worse than non-existance (having never been born). I must admit, that seems to be good reasoning. However, I believe understanding the style of metaphor that is prevalent through Scriptures helps us clarity how exactly Jesus was speaking. “David prays that his enemies’ arrows be “like the snail that dissolves into slime, like the stillborn child who never sees the sun.”. He asks for the LORD to make his enemy’s plans come to nothing. Having the opportunity to live and see the sun is very important. It is a terrible fate to never have had that experience. It is a life that is wasted. But what Jesus said about Judas was that his fate was worse than that of a wasted life. It was a life that could have been lived for Jesus, but was not. Judas was a disciple. He learned what the other disciples learned, saw the miracles that they saw, but he ended up turning away from that. His life was truly wasted, and that made it worse for him than for the man who was never born. David’s prayer would suggest that the reason Jesus pronounced a woe upon Judas was not so much what Judas would experience in hell as what he refused to experience in his life” (1). Joe quoted the verse mostly used by those who adhere to the ‘Tradionalist view’ of Eternal Conscious Torment, that being Matthew 25:41-46. I believe this has more to do with understanding that ‘eternal’ doesn’t necessitate a duration of time, rather can mean something that is eternal in its results. When something is eternally destroyed, it is not continually destroyed, right? No, it’s simply destroyed once and for all. While I enjoyed Joe’s presentation, I continually waited to hear how he would explain the ‘wicked’ have something that lives on. Joe appealed to the ‘image of God’ in Genesis, and offered his understanding of the Biblical anatomy of man according to the Bible- thus giving all men something that naturally gives them eternal life. Joe also mentioned his understanding of “The Eternal Day” (to which he has an accompanying article available through him), which gives him an understanding of “Eternal Judgment” that is ongoing for every Believer. There was much that brother Joe shared that I disagreed with (the ‘image of God’ giving all men a state of immortality, degrees of punishment, my subjective desire to see wicked people like Adolf Hitler suffer, future eternal judgment, and his conclusions of Eternal Conscious Torment), however I so appreciate his willing to not only speak upon the topic, but also answer questions and come to Bible study after he spoke for another 2 hours! Yes, we at B.P.B.C.are hungry for the Word of God. Plus, it gave us some time to fellowship and enjoy some Miller Lite. As you can imagine, we are a congregation that understands and adheres to ‘Conditional Immortality’, especially due to the diligent study and writing of a book done by our former pastor, Clair Chandler. His book is now out of print, however I own a copy and can share prints, notes, and details – Immortalizing Evil. The next morning everyone at Adult Sunday School had questions and wanted to examine the Scriptures. Surely we are a blessed lot over here on Blue Point Ave.
As I examine what the Scriptures said in regards to the final state of the Wicked, especially as I understood the context as a I mentioned the previous Sunday, I was really becoming convicted. Recently, I explained it as an allegory of standing outside the gates looking around at the final state of the wicked, I was gripped with an evangelistic attitude. Now I will admit….this can be from reading a host of Rick Joyner style books (ha ha, Google his books), or it could be an over-active imagination. However, I truly believe that when we understand the context of the narrative revealed in Scripture, we are given a reality of lives lived outside the kingdom of God. This should break out hearts. I announced to the church that I will be looking to publish a book on these details of not only the finality of the state of the wicked, but how that should compel us to live as citizens of the New Jerusalem. Pastor Bruce Bennett of The Word of Truth in Farmingville, New York, was among those who responded to my call for speakers upon this topic of “hell”. Pastor Bennett started his presentation by listing a bunch of verses that point to judgment – Matthew 11:20-24, Matthew 13:41-43 and 47-50, Mark 9:42-44, and Luke 12:47. Bruce spoke the place which Jesus calls the place of unquenchable fire, detailed his understanding of ‘demonology’, death as seperation from God, the valdity of near-death experiences as well as outer-body experiences, yet he would not take a stance on pertinent issues of the topic. For example, Pastor Bruce Bennett did not explain whether he holds to Eternal Conscious Torment or Conditional Immortality (he erroneously labeled “Annihilationism” as heretical the entire time, yet not realizing the views within the Annihilationist perspective are varied and Edward Fudge and his followers refer to their position as “Annihilationists”). It would be the details of such a discussion that would show the distinction of the so-called Evangelical understanding of ‘Annihilation’ versus the understanding of cult style groups such as Jehovah Witnesses. Pastor Bennett also would not detail whether he understood the passage of the Rich Man and Lazarus as a parable or a literal story, which would have gave more clarity to what he believes on this topic. Pastor Bennett’s presentation was focused more on understanding a necessity of “future judgment”. There are some who understand Full Preterism who adhere to a “future judgment” scenario, as I have shown through my messages this series- I don’t believe context allows for that. I believe judgment has been rendered. One is condemned or not. One has put on the robe and entered the gates of the New Jerusalem and ate of of tree of life, as per the imagery in Revelation chapters 21-22. In Christ, I am free of condemnation (Romans 8:1). I can however understand the ‘Futurist’ position of calling for future judgement, and even the desire many Preterists have to force that in our future, yet its false and outside the context and full understanding of the narrative of Scripture, especially the imagery of Revelation. Unfortunately, I lost the audio of Pastor Bruce’s presentation that night. I am terribly sorry. However, with as much force and use of the term ‘heretic’ for those who do not agree with his understand as he preached, hopefully he would be willing to preach the same message from his own pulpit and allow his church to hear it and you through podcast. I have thanked Pastor Bennett for his willingness to visit our church and speak before us. His knowledge of Scripture is clear, all the while we surely disagree with how the context of Scripture flows and our understanding of details that build not only our eschatology, but our frame of Scripture. Also, Pastor Greg mentioned that he was using a Dake Bible which was put together by Pentecostal theologians. Right from the outset of Pastor Greg Wilk’s presentation I began to see where and why we disagree not only on this topic of hell, but other areas as well. It seems that when Pastor Greg speaks of “the Spirit world” this necessitates the beginning of an “other world” story. For example, I was both excited and shocked to hear Pastor Greg in speaking about a ‘pre-adamic race”, however it immediately turned to talking about the fall of an angelic being named Satan which he derives his interpretation from Isaiah chapter 14. He told the story of the fall of these angelic beings, and God’s destruction of them with chaotic waters. Pastor Wilk then harped on the term “replenish” found in Genesis 1:28. Scholars in the realm of ‘textual criticism’ have long since proven the Hebrew term translated as “replenish” does not necessarily mean to fill again, but rather to fill completely. Also, many scholars in the textual analysis of Ancient Near Eastern writings have called for the re-examination of Biblical writings, phrases, and understandings in light of what we have learned from ANE texts. Pastor Greg continued to espouse the doctrines of the Church of God (while admitting that at times he can be quite the ‘rowdy reformer’ type), and detailed his understanding of Satan’s dominion on earth and his yet future judgment and damnation to the lake of fire. Pastor Greg’s position is dealing with the contamination by angelic confusion that he supposes happened in Genesis 6, and thus Satan seeking t bring man down- something he has personal testimony in. There were many questions asked of Pastor Greg after his presentation, and sadly I noticed that we didn’t get all that time recorded on our podcast. I can say, Pastor Wilk answered honestly and usually quoting from the notes he brought from the Dake’s Annotated Reference Bible. For example, when asked about the passage in Luke 16 dealing with the rich man and Lazarus, he simple offered that it does not sound like a parable and said the notes explain it. Also, he asked asked about “immortality” and how according to 1 Corinthians 15, we understanding this to be talking about those in Christ (the Corinthian Church) who would put on immortality, not everyone. Pastor Greg graciously responded that he had not heard that point before. I love when leaders are humble enough to admit there are things they can continue to study. It surely was a great time to learn and challenge ourselves. I was able to read through Edward Fudge’s books – The Fire That Consumes (which is more of a ‘reference encyclopedia rather than a book) and Hell: A Final Word. Also, Mrs. Majorie Chandler sent me a copy of Pastor Clair Chandler’s book which I was able to enjoy. This month surely solidified my position on the lack of ‘immortality’ for the Wicked, and the complete “death” they suffer as a final state outside of Christ. I see no room for a yet future judgment or this seemingly opposite the clear words of “destruction”, “death”, and “perish” view of ‘eternal conscious torment’. To me the following verses sum up a simple understanding of what happens to the life of the wicked after judgment – 2 Peter 2:6; 2 Peter 3:7, Jude 7, and a cross reference with Genesis chapter 19. Again, I want to thank the willingness, the gracious, and the blessedness of the congregation at The Blue Point Bible Church for being willing to go through this series. *I do not necessarily agree with the conclusions nor the methods used to draw them of all these listed sources.